Rumours of a Toshiba-branded Chromebook began circulating back in September 2013, and now the Japanese tech giant has lifted the lid on its first entrant into Google's cloud-powered world. The imaginitively-titled Toshiba Chromebook immediately stands out from competing Chromebooks with 11-, 12- and 14-inch displays by being the first to opt for a 13.3-inch, HD panel (1366 x 768). Toshiba has gone for a non-touch variant, presumably to keep its cost competitive with affordable hotshots like HP's $279 (£229/AU$418) Chromebook 11. Driving Chrome OS is an Intel Celeron 2995ULT CPU (part of the chipmaker's Haswell line) with integrated graphics that's backed up by 2GB of RAM (1600Hz). Local storage is present in the form of a 16GB iSSD, and the laptop will run for around nine hours on a single charge, according to Toshiba. Included in the deal is one year of free Google Drive cloud storage (100GB) that provides room aplenty for storing multimedia content in the cloud. The Toshiba Chromebook isn't lightest or heaviest model on the market, weighing 3.3lbs and spanning 328.6mm x 227mm. It measures 20.2mm at its thickest point, providing enough chunk for an HDMI port, two USB 3.0 ports and an SD card slot. Connectivity options are present in the form of Wi-Fi (a/g/n) and Bluetooth 4.0. 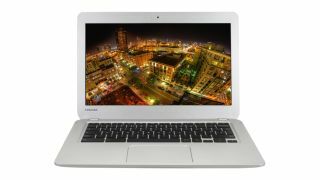 If 13.3 inches of Toshiba Chromebook appeals to you, the machine is set to land on European shelves during the first quarter of 2014 for £249. Countries included are the UK and Ireland, France, Germany, Netherlands, Sweden, Finland and Switzerland. In the US, it'll launch on February 14 and will retail at US$279 (around AUS$455). No word yet on official Australian availability or pricing. Toshiba is a heavy hitter in the laptop world, and its foray into Chromebooks isn't entirely unexpected. If figures are to be believed, the inexpensive laptops coughed up some pretty impressive sales figures last year, and they may be in a position to demand more respect in 2014 than in previous years.